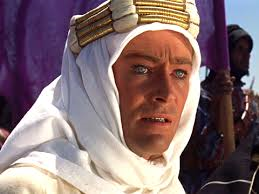 What can I write that hasn’t been written before about the timeless appeal of “Lawrence of Arabia” and the performance of Peter O’Toole? It is bound to pop up on a “Best Films of all Time” list just about every year. This is the kiss of death for most films. Casablanca and Citizen Kane, then Wizard of Oz and then Lawrence…that is how it goes. But in the case of “Lawrence”, it is a timeless film made in a timely fashion. The retread is never bare. We are in the Middle East in a big way in our immediate lifetime and Lawrence speaks to us of the problems we face. It posits the questions and underlines the insurmountable problems that will never be solved as we try even now to brave the desert sands. There are so many brave souls that have perished for the cause of war in our country. Lawrence speaks to us of the timelessness, the inevitability of our destiny, saying, NOTHING is written… That was one of the main themes of the film. Nothing is written. And it has been a mantra for our American Destiny as we forge ever onward. O’Toole/Lawrence’s face and demeanor spoke volumes of his bravery and yet his naïveté in dealing with a culture he could never fully understand. Our naïveté and bravery in the face of insurmountable odds are facing us again in Afghanistan. This film should be a primer for anyone who dares to try and speak the truth about the muddle of the Middle East. There are some things that are not meant to be known entities and the East and the Desert are two of those things. T.E. Lawrence is a man for all seasons and Lawrence of Arabia is a film for all time. See this movie if you haven’t done so. Put it on your bucket list. This is one that will not disappoint.